Committee attendance: Linda Dowling; Chairman, Joan Karpf, Sue Kraabel and Jack Catalano. Also in attendance: Jeremy Oleson and Evan Karpf on camera. Meeting called to order at 7:05pm. Sue requested an addition be made on page 2 under Solid Waste Disposal after "Supervisor position." , to read: Sue and Jack sent a recommendation to the Select Board that the staff of the Transfer station be part time employees without benefits. She also requested an addition be made on page 2 under Property Assessing after "such as abatements" to read: " and pick ups." Sue made a motion to accept the minutes with the additions. Jack seconded the motion. Motion was approved 4-0. The Committee was informed that the Selectman voted to accept their amended budget total of $1,458,971.00 by a 3-0 vote. A copy of their new line numbers was presented with the understanding that they may be changed until they legally can't. Jeremy Oleson from the Fire Department came before the Committee to inform them that a line was added to the FD budget to include costs for Detail work . The new line was budgeted $1.00. �	Sale of Town Property: Ambulance Billing line and Rec Dept line to be removed from this category in 2013. �	Interest on Investments: Sue made a motion to accept $500 for this line. Joan seconded the motion. Motion was approved 4-0. �	Other Misc Revenue: Linda made a motion to accept $3,000 as the revenue amount for this line. Sue seconded the motion. Motion passed 4-0. �	Town Clerk Misc. Sue motioned to accept $500 for this line. Joan seconded. Motion approved 4-0. �	Sue requested we revisit the In Lieu of Taxes line to adjust for new higher figures. We had received a payment from AMC. Sue made a motion to increase the revenue from $40,000 to $61,500. Joan seconded the motion. Motion approved 4-0. After discussion it was decided that 02, 03, 04, 05, 06 and 08 lines did not need to be voted on because they don't affect the tax rate. They are set up for accounting purposes. Sue requested we revisit the salary lines for the Solid Waste Disposal Department. The Select Board had voted in favor of the salaries as listed: Supervisor $33,280.00 and Attendant $24,311.00. Discussion followed regarding reallocating salaries to create 2 part time positions. Sue suggested we present it to the public this way. Joan stated that she again couldn't agree with that since the Supervisor requested it be full time considering the amount of work the job requires. She stated that this department is one of the departments that brings revenue to the Town and she would hate to see that be jeopardized. The present Supervisor has taken a department that use to cost the Town thousands and created one that brings in revenue to help cover its expenses. Joan stated that she would follow his recommendation. Discussion followed. Sue asked if anyone else on the Committee agrees with her position to change the salary figures. The Committee decided to leave the salaries as stated. 1. To see if the Town will vote to raise and appropriate the sum of $1,000 for the maintenance of the old landfill. This includes needs for actual physical maintenance, engineering and overseer expenses. The appropriation will come from the Landfill Closure Capital Reserve Fund established for this purpose. No money will be raised from taxation. Selectman recommend this by a vote of 3 to 0. Joan made a motion to recommend. Sue seconded the motion . Motion carried 4-0. 2. To see if the Town will vote to raise and appropriate the sum of $2,500 to hold a Household Hazardous Waste Collection Program. Selectman recommend this by a vote of 3 to 0. Joan made a motion to recommend. Sue seconded the motion. Motion carried 4-0. 3. To see if the Town will vote to raise and appropriate the amount o $11,000 to fund Planning Board, Zoning Board of Appeals and the Property Inspector-Code Enforcement Officer Salary. And further to authorize the withdrawal of such amount from the Planning Special Revenue Fund established in 2006 for that purpose. No money to be raised from new taxation. Selectmen recommend this by a vote of 3 to 0. Sue motioned to recommend. Jack seconded. Motion carried 3-1. 4. To see if the Town will vote to raise and appropriate $18,500 to upgrade the Tritech Software for the Police Department's in house, computer-based reporting system. This will be the first upgrade since 2000. Selectman recommend this vote by a vote or 3 to 0. Sue motioned to recommend. Jack seconded. Motion carried 4-0. 5. To see if the Town will vote to raise and appropriate the sum of $16,450 to purchase a Glass Crusher for the Transfer Station and Recycling Center. This appropriation will be raised from the Recycling Special Revenue Fund. The costs are as follows: $12,000 for the glass crusher, $1,000 for shipping, $3,450.00 for materials and labor for the enclosure and glass table. No money raised from taxation. Selectmen recommend this by a vote of 3 to 0. Joan motioned to recommend. Sue seconded. Motion carried 4-0. 6.To see if the Town will raise and appropriate the sum of $9,171.00 for ground water monitoring of the old landfill. $2,937.00 to pay for the engineer to take the samples, produce reports and send results to the Town and State. $6,234.00 to pay the laboratory fees to process the samples. The total amount to come from the existing Landfill Closure Trust Fund established for this purpose. No amount raised from taxation. Selectmen recommend this by a vote of 3 to 0. 7. Committee requested wording change. 9. To see if the Town will vote to raise and appropriate the sum of $12,375.00 to purchase three storage trailers for the Transfer Station/Recycling Center. This appropriation will be raised from the Recycling Special Revenue Fund. No money raised from taxation. Selectmen recommend this by a vote of 3 to 0. Sue motioned to recommend. Joan seconded. Motion carried 4-0. 10. To see if the Town will vote to raise and appropriate $20.000 for 2013 tipping of bulky waste� and further to authorize the withdrawal as needed from the Recycling Equipment Special Revenue Fund established at the 2001 Town Meeting for this purpose. No money raised from taxation. Selectmen recommend this by a vote of 3 to 0. Joan motioned to recommend. Jack seconded. Motion carried 4-0. 11. To see if the Town will vote to raise and appropriate the sum of $24,000 to be placed in a new Property Revaluation Capital Reserve Fund for the purpose of completing a total revaluation of the Town in 2017- as mandated by the State- at five year intervals. This will be the first request to attain the total cost of $120,00 for the total process as quoted by our appraisal company. Selectmen recommend this by a vote of 3 t0 0. 12 . No money in warrant. 13 To see if the Town will vote to raise and appropriate $2,00.00 to be placed in the Computer Technology Capital Reserve Fund. Selectmen recommend this by a vote of 3 to 0. Sue moved to recommend. Jack seconded. Discussion followed. Linda stated that the account has approximately $17,000. Sue retracted her motion and motioned not to recommend. Jack seconded. Motion carried 4-0. 14. To see if the Town will vote to raise and appropriate $2,000 to be placed in the Library Improvement Capital Reserve Fund. Selectmen recommend this by a vote of 3 to 0. Discussion followed. Sue stated the Library has approximately $17,000 in the Fund. Joan Made a motion not to recommend. Sue seconded . Motion carried 4-0. 15. To see if the Town will vote to raise and appropriate $10,000 to be placed in the Landfill Closure Capital Reserve Fund. Selectmen recommend this by a vote of 3 to 0. Linda stated that we have approximately $155,000 in the Fund. Discussion followed. Sue stated we spend money from this every year for testing. Linda motioned to recommend. Sue seconded. Motion carried 3-1. 16. To see if the Town will vote to raise and appropriate $35,000 to be placed in the Road Improvement Capital Reserve Fund. Selectmen recommend this by a vote of 3 to 0. Sue motioned to recommend. Linda seconded. Discussion followed. Linda stated that the roads are in dire need of work and that comes at a major expense. Joan stated she was aware of the Highway Grant Money which the Town will vote to be placed in a SRF for future road work. Joan questioned the $35,000 figure. Sue stated it was the number used last year. Sue motioned to recommend. Sue seconded. Vote was 2-2. 17. To see if the Town will vote to raise and appropriate $30,000 to be placed in the New Land & Building Capital Reserve Fund. Selectmen recommend this by a vote of 2 to 1. Sue motioned to recommend. No second. Joan motioned not to recommend. Jack seconded. Discussion followed. Linda state that the Reserve Fund contained approximately $185,000. Joan asked if there was a plan on the table. Sue stated that we have the police department in a rental space which costs the Town a lot of money. Joan stated that she agreed but that she felt this wasn't the time to place money in a Fund that has no plan. Motion carried 4-0. 18. 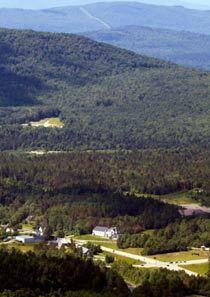 To see if the Town will vote to raise and appropriate the sum of $923 as the Town's contribution to the Northern Human Services- White Mountain Mental Health and Common Ground, a non-profit mental health and development service center. Selectmen recommend this by a vote of 3 to 0. Joan stated that she would like to see more information regarding the feel good requests. She would like to see how the figures are determined and the figures of utilization by members of the Town. She stated that she is looking into County services which are provided to us through our County tax. She stated that our Town pays a large portion of the County's bill and she wants to be assured that there isn't an overlap or duplication of services that we are already paying. Sue motioned to recommend. Jack seconded. Motion carried 3-1. 19. To raise and appropriate the sum of $2,000 to donate to the Tyler Blain House, in Lancaster NH one of the only homeless shelters in Northern NH. Selectmen recommend this by a vote of 3 to 0. Sue motioned to recommend. Jack seconded. Sue stated that the Town has utilized their services. Motion carried 4-0. 20. To see if the Town will vote to raise and appropriate the sum of $875 payable to Littleton Regional Hospital to help offset the cost of charity care and community benefit programs the Littleton Hospital provides. Selectmen recommend this by a vote of 3 to 0. 21. To see if the Town will vote to raise and appropriate the sum of $1,167 and turn over monies to the Northwoods Home Health & Hospice Services, a division of Weeks Medical Center. The monies are used to provide home health care services to the residents of Carroll. Selectmen recommend this by a vote of 3 to 0. 22. To see if the Town will vote to raise and appropriate the sum of $1,000 for the support of preventative and primary health care services of Ammonoosuc Community Health Services Inc. for the residents of Carroll. Selectmen recommend this by a vote of 3 to 0. 23. To see if the Town will vote to raise and appropriate the sum of $1,797 payable to North Country Home Health & Hospice Agency, Inc for the support of the home health care, supportive care, medical hospice and community health programs and services . Selectmen recommend this by a vote of 3 to 0. 24. To see if the Town will vote to raise and appropriate $356.00 for the American Red Cross. Selectmen recommend this by a vote of 3 to 0. Sue motioned to not recommend. Joan seconded . Motion carried 3-1. Jack changed his vote. Motion carried 4-0. 25.To see if the Town will vote to raise and appropriate the sum of $2,000 for the Caleb Interfaith Volunteer Caregivers that serves the needs of the elderly people in the community. Selectmen recommend this by a vote of 3 to 0. Sue motioned to recommend . Linda seconded. Motion carried 3-1. 26. To see if the Town will vote to raise and appropriate the sum of $500 for CASA of NH for recruiting, training and supervising volunteers who advocate in NH's courts for the best interests of abused and neglected children. Selectmen recommend this by a vote of 3 to 0. 27. To see if the Town will vote to raise and appropriate the sum of $830.00 for Tri County Community Action Program in support of their services for the community. Selectmen recommend this by a vote of 3 to 0. Sue motioned to recommend. No second. Joan motioned not to recommend. Linda seconded. Motion carried 2-1. 1 abstained. 28. To see if the Town will vote to raise and appropriate the sum of $2,000 to the Coalition Communities in Portsmouth, NH consisting of 36 towns to represent the Town of Carroll in a solution to our educational funding crisis by opposing the re-establishment of donor towns and keeping the statewide property tax so that it can be used locally to fund our own education assessment from the White Mountains Regional School District. Selectmen recommend this by a vote of 3 to 0. A question arose as to how much money they have and how is it being spent. It was calculated that 36 towns at $2,000 totaled $72,000 collected a year. Sue motioned to not recommend. Joan seconded. Motion carried 4-0. 29. To see if the Town will vote to raise and appropriate the sum of $350 in support of the Senior Meals Program run by Tri- County Cap, Inc. North Country. Selectmen recommended this by a vote of 3 to 0. 30. To see if the Town will vote to raise and appropriate the sum of $35,000 for the purpose of purchasing a tractor with a front bucket, plow, snow blower and sander to be able to clear all the Town's sidewalks in accordance with NH State law set by the Americans with Disabilities Act, RSA 231:90-92-1; $31,000 will be withdrawn from the Highway Equipment Capital Reserve Fund and $4000.00 will be raised by taxation. The Selectmen recommend this by a vote of 2 to 1. 31. No money. No vote needed. 32. No money. No vote needed. 33. To see if the Town will vote to raise and appropriate $15,000 to be placed in the Municipal Truck Capital Reserve Fund. By Petition. Selectmen do not recommend this by a vote of 2 to 1. 34. To see if the Town will vote to raise and appropriate $10,000 to be place in the Highway Equipment Capital Reserve Fund. By Petition. Selectmen do not recommend this by a vote of 3 to 0. Discussion followed. Linda stated the fund had approximately $62,000. Joan motioned to not recommend. Jack seconded. Motion carried 4-0. 35. To see if the Town will vote to raise and appropriate $18,000 to be placed in the Police Cruiser Capital Reserve Fund. By Petition. Selectmen do not recommend this by a vote of 2 to 1. Sue motioned to recommend. No second. Jack motioned to not recommend. Joan seconded. 36. No money. No vote needed. Sue asked to revisit revenues. The Committee will be meeting on the 1/9/2013 for their first public hearing. Sue shared possible hand outs for the Hearing. Discussion followed. Committee agreed on all handouts. Joan made a motion to adjourn. Sue seconded. Motion carried 4-0.